Place arame and water in a saucepan, cover and simmer 15 minutes. Remove arame, rinse, drain and mince arame. Remove stems from the mushrooms and set aside. 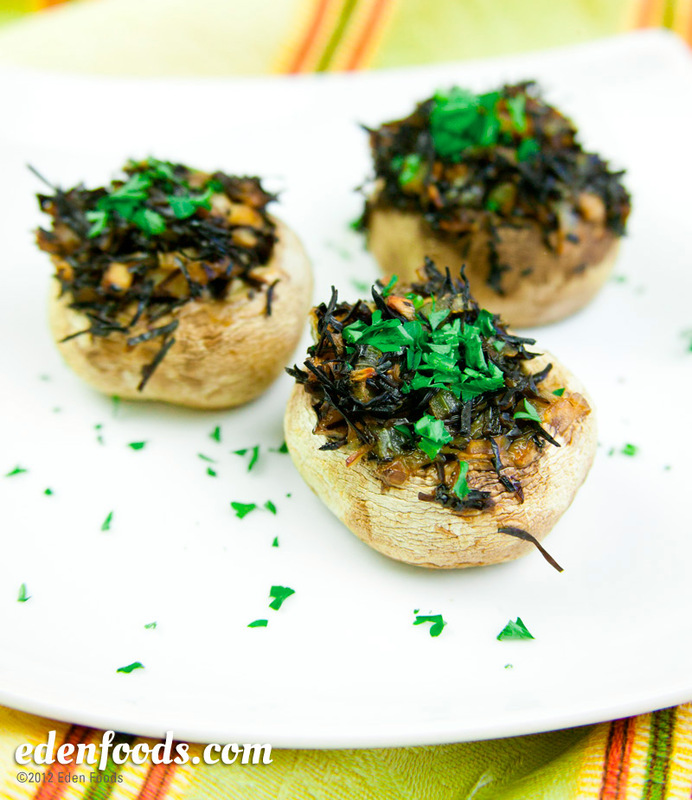 Place mushrooms in a baking dish. Dice the stems. Heat oil in a small pan. Sauté onions and mushroom stems for 3 to 5 minutes. Add arame. Combine mirin, shoyu, lemon juice and ginger juice. Pour half over the arame mixture and simmer until liquid evaporates. Stuff mushroom caps with arame mixture. Pour remaining marinade over each mushroom cap. Cover and bake at 350° for 20 to 25 minutes. Garnish. Be careful not to overcook, as the mushrooms will shrink. Garnish with parsley.